Arrive on Saturday, January 18 and depart on Monday, January 27, 2020 — 9 nights, 10 days in textile heaven! Trip is limited to 11 participants. 7 spaces open. Cost is $2,795 per person shared room or $3,295 per person for private room. See details and itinerary below. We have invited a noted cultural anthropologist to travel with us. 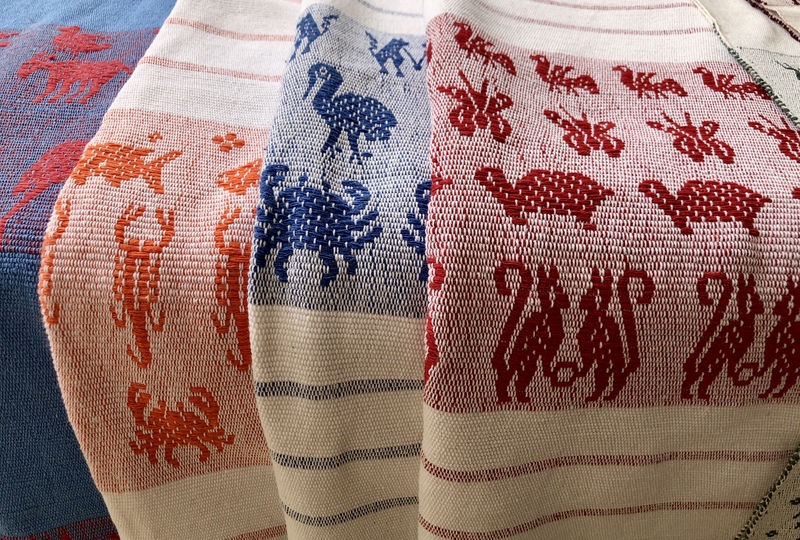 She has worked in the region for the past fifteen years and knows the textile culture and people intimately. We learn about and discuss motifs, lifestyle, endangered species, quality and value of direct support. Monday, January 27: Depart for home. Note: You can add days on to the tour — arrive early or stay later — at your own expense. The workshop does NOT include airfare, taxes, tips, travel insurance, liquor or alcoholic beverages, some meals, and optional local transportation as specified in the itinerary. It does not include taxi or shuttle service to/from airport to/from hotel. Reservations and Cancellations. A 40% deposit is required to guarantee your spot. The balance is due in two equal payments. The second payment of 30% of the total is due on or before October 1, 2019. The third 30% payment is due on or before December 1, 2019. We accept payment using online e-commerce only. We will send you an itemized invoice when you tell us you are ready to register. After December 1, 2019, there are no refunds. If you cancel on or before December 1, 2019, we will refund 50% of your deposit received to date. After that, there are no refunds. We will send you an itemized invoice when you tell us you are ready to register. After December 1, 2019, there are no refunds. Required–Travel Health/Accident Insurance: We require that you carry international accident/health insurance that includes $50,000+ of emergency medical evacuation insurance. Proof of insurance must be sent at least 45 days before departure. In addition, we will send you by email a PDF of a witnessed waiver of responsibility, holding harmless Norma Schafer and Oaxaca Cultural Navigator LLC. We ask that you return this to us by email 45 days before departure. Unforeseen circumstances happen! Be certain your passport has at least six months on it before it expires from the date you enter Mexico! Terrain, Walking and Group Courtesy: We will do some walking and getting in/out of vans. If you have mobility issues or health/breathing impediments, please let us know before you register. This may not be the study tour for you. Well-Being: If you have mobility issues or health impediments, please let us know. Our travel to remote villages will be by van on secondary roads with curves, usually not for more than an hour or so. When you tell us you are ready to register, we will send you a health questionnaire to complete. If you have walking or car dizziness issues, this may not be the trip for you. Traveling with a small group has its advantages and also means that independent travelers will need to make accommodations to group needs and schedule. We include free time to go off on your own if you wish. 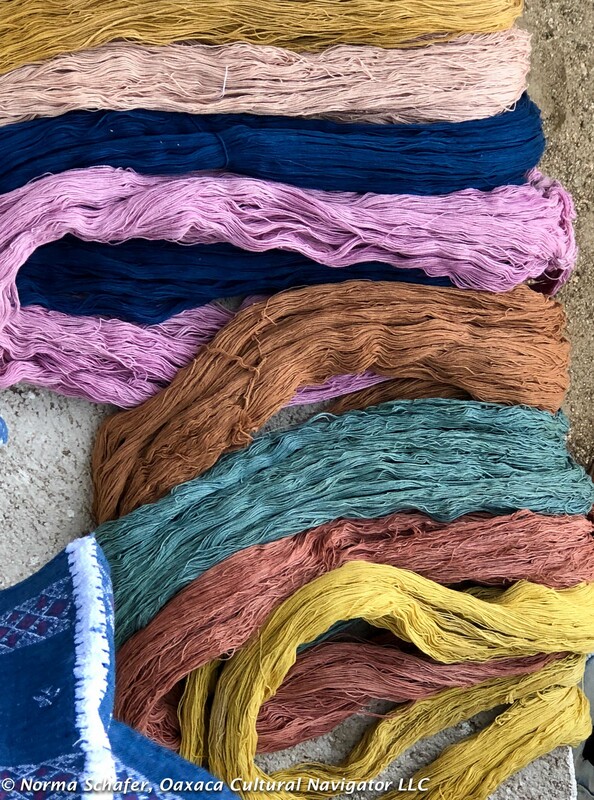 Writing from Santa Fe, NM: I’m staying at the house of my textile designer friend Norma Cross, who creates felted fiber clothing using natural dyes, wool, silk, and cotton. 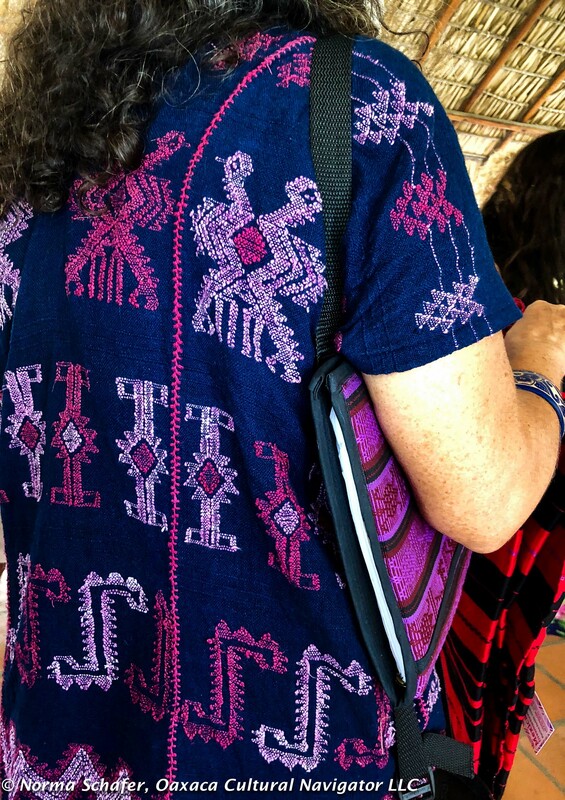 I brought with me a shirt made on the Oaxaca coast with threads colored purple from the caracol purpura dye. That led her to send me this article about the Phoenician history of harvesting the purple snail and dyeing religious and political garments with snail ink. This process is still in practice today in Oaxaca, Mexico, along the Pacific Coast. The murex snail is now extinct in Morocco where the Phoenicians plied the waters during the Roman Empire. It is extinct now in most places around the world. There is a revival in Israel where the natural blue color is being used for religious garments as it once was in the 8th century. Preservation of the snail and it’s priceless ink is alive and well in Oaxaca. Yet, the risk of extinction is high because of poaching. I hear that the resort hotels in Huatulco make a special cocktail using the purple snail. They buy the dye from people who illegally harvest it. And, people are unconscious consumers! 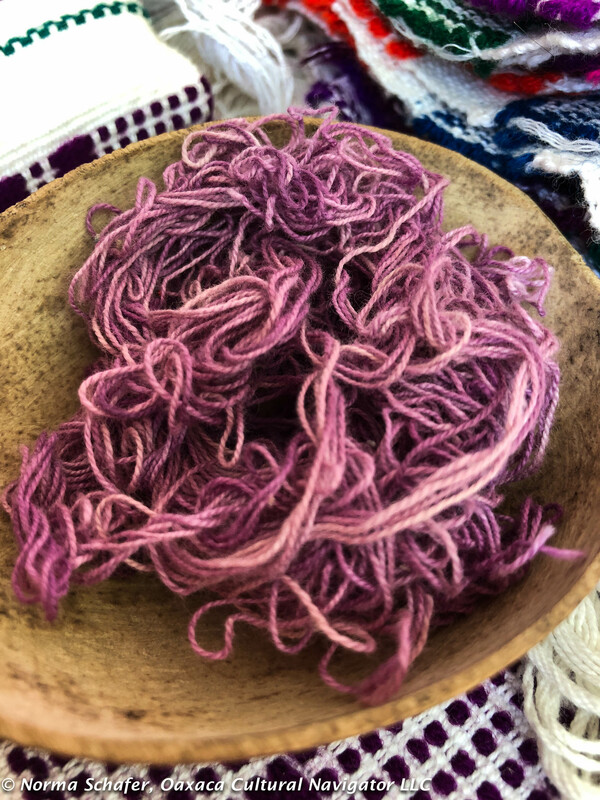 On our Textile Tour of Oaxaca’s Costa Chica, starting January 11, 2019, we will see some glorious handwoven cotton fabrics where the supplementary weft and embroidered threads of the joinery use the rare purple dye. 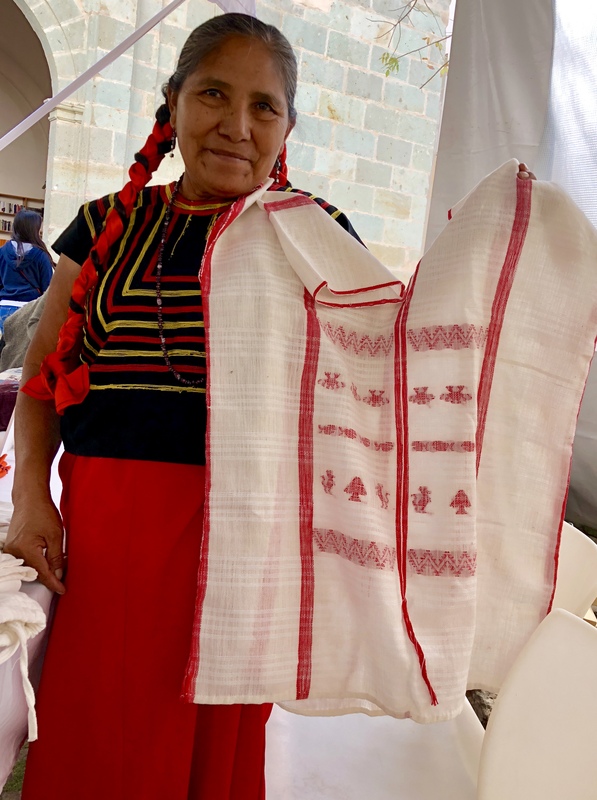 The pieces are created in two neighboring villages, San Juan Colorado and Pinotepa de Don Luis, where we will visit artisans and see how they prepare the native cloth.